The game will be played by three teams. 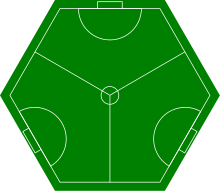 The game will be played on a hexagonal pitch of equal sides. There will be three goals in total, positioned along alternating sides of the pitch. Games will be played in periods of equal thirds. The winning team will be the team which concedes the fewest goals. However, beyond these fundamentals there has so far been a lot of room for interpretation and experimentation according to the particular circumstances in which matches are played and the whims and inclinations of those playing. We will write more on different 3SF rule variants in future blog posts. Three-sided football originated in the writings of Danish artist and philosopher Asger Jorn. Jorn created the idea of three-sided football in his 1962 book Naturens Orden as a metaphor to explain his theory of triolectics, looking at what happens when a third party is introduced to the classic two-party confrontation paradigm. However, as it was only a metaphor, Jorn never attempted to bring three-sided football into the real world, and as far as we’re currently aware it wasn’t until 1993 that the first game of three-sided football was played in Glasgow. Following that first match a number of one off games were played, until Mark Dyson organised the first game of what would become the Deptford 3SF League in 2012. Since then regular matches have been played, first in Deptford Park before moving to its current home of Fordham Park. For a more detailed history of three-sided football check out our History of 3SF.